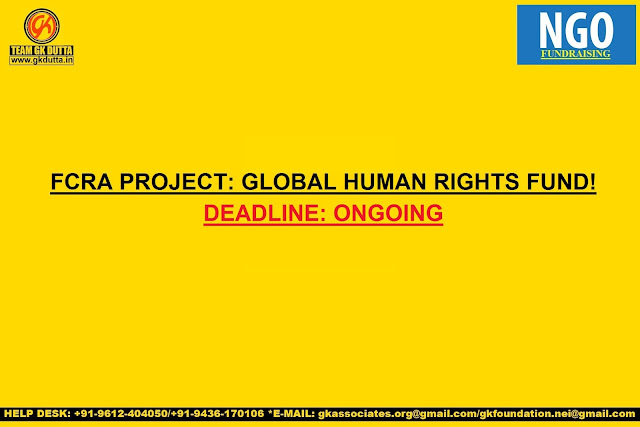 FCRA PROJECT: GLOBAL HUMAN RIGHTS FUND! The Fund for Global Human Rights was founded in 2003 to move human rights forward by providing resources and tools to the people and organizations on the ground that have real potential to generate positive change. Fund’s grants and technical assistance are focused on crucial and difficult work that otherwise might wane for lack of resources, bring financial stability to human rights groups, and help human rights defenders increase their visibility and impact. The Fund defines human rights activities as those that seek to challenge the structures of power so that they defend, protect, and promote human rights. The Fund does not have thematic restrictions and supports organizations working to address a wide range of human rights problems. Examples of some of the recent grantees are- defend indigenous land rights in Guatemala, promote women’s rights in Morocco, and struggle for accountability for war crimes in West Africa. The Fund has awarded over $50 million in grants to more than 300 on-the-ground human rights groups. Grants outside of regular funding cycle and beyond the eighteen focus countries where the Fund for Global Human Rights is working. These grants can help protect the security of activists under threat. Applicants seeking an emergency grant can contact the foundation via email. The Fund makes grants to local, national, and regional non-profit, human rights organizations based in the countries where it has grant programs. The programmes are currently in Algeria, Morocco, Tunisia, Egypt, India, Pakistan, Mexico, Guatemala, Honduras, Liberia, Sierra Leone, Guinea, Democratic Republic of the Congo, Uganda, Burundi, Thailand, the Philippines, and Burma. Demonstrate leadership, innovative approaches, and significant long-term potential to have an impact on policy at the local or national level. Demonstrate organizational commitment to human rights. Whose activities involve and/or are led by the beneficiaries. Are interested in building relationships with other human rights organizations. In all countries, women-led human rights organizations are strongly encouraged to apply. The Fund do not supports stand-alone conferences, individuals, businesses, scholarships, fundraising events, university-based research, government agencies, micro-credit programs, construction of roads, bridges, buildings, wells or medical facilities, or activities. The Fund generally does not support literacy training, vocational training, or social/psychological/medical services, unless these activities are part of an integrated strategy to provide the recipients of these services with human rights education and with tools to defend and demand their rights. Emergency grants are given to organizations who did not received funds from the foundation previously or to those based in countries where do not have a grants program.